If you are entering a crafting market or markets in a serious fashion then storage space is a key resource. The ability to store raw materials as you buy them at low prices on the Auction House is an absolute requirement. The Bank and its bag slots are unlikely to prove sufficient and shuffling materials between alts will prove cumbersome. 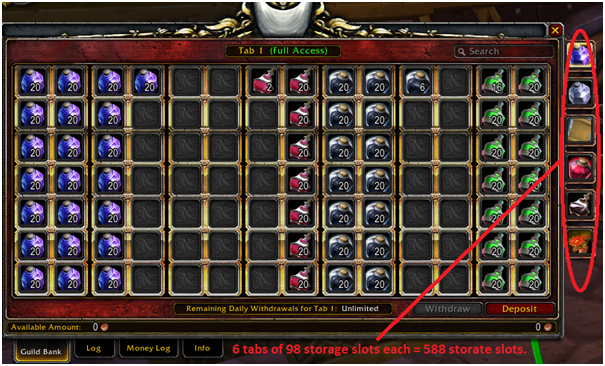 To resolve this, owning a guild and being the sole member will give you an additional 588 storage slots. 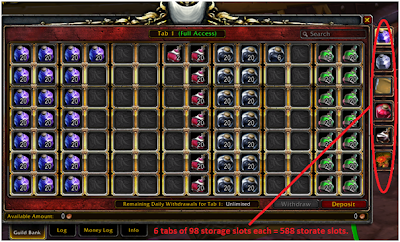 In the Guild, each tab has 98 item slots and tabs are purchased much like bag slots in Banks. The first tab costs 100 gold, the next 250 gold, then 500 gold and so on. To buy all 6 tabs you would spend 9350 gold. Technically, you can get 8 guild tabs but your guild needs to reach at least level 5 and, lets face it, a guild of one person used for crafting is not going to advance. Setting up a Guild Bank. The good news is that setting up a guild bank is very easy, quick and has a low cost (easily under 100 gold). 1) Talk to the Guild Master NPC in a major city to purchase the Charter for 10 silver (see below for the names and locations – but asking a City Guard will give you the location). 2) You need three other players to agree to be members of your guild to get it up and running. So, go to the starter area and ask players to sign the Charter in exchange for 10 gold. All starter players, and even new alts, will be willing to do this. Don’t be deceiving, explain that you only need their signatures and that they will be kicked from the guild when it is started. So whisper the question first, if the answer is yes then present the charter to be signed. 4) Kick the signatory players and there you have your Guild. Be aware that the players that signed your Charter can delete their character or sign another Charter and so remove their signatures from your Charter. So don’t hang around once you have your four signatures. Also, be aware that it is one signature per player – so a player’s alt cannot sign the charter. The whole process should take less than half an hour. The Downsides to having a Guild Bank. 1) That character can not belong to another guild –so say goodbye to raiding for that character. 2) It is hard to pass a guild bank to another alt –you will need a trusted friend online to allow you to pass the guild bank to them and then log on the alt to receive the guild bank. Thanks for the timely post, I hadn't realised that the nerf to the number of signatures for a guild charter was quite so big. I have been scouting around to buy a level 25 guild for some perks and a 7th (or even 8th) tab. Unfortunately, while I would pay 100k for one, I'm yet to see one available for under 200k. I passed up an opportunity to buy a level 14 guild for 30k (which is 10k on top of the cost of tabs). I figured since the more compelling perks are at a higher level I could save myself a guild rename (which cost regular currency) and 20k just starting one from scratch. i have never really considered buying a higher level guild - though the extra tabs would be helpful and some of the perks. I would imagine that the best time to buy is at the end of school holidays? perhaps now even if the slow content is causing people to leave despite Mists of Pandaria being around the corner? There is an easier way to pass ownership too without giving another player the guild first. You can just have ANYONE join and invite your alt. They need no other power than invite power. You can then remove them from guild and get on Guild Master toon and type /gleader "nameofnewleader" without the quotations. and something well worth knowing to avoiding tieing a character down to a life outside a normal guild. I'm actually looking for LvL 25 Guild but i have absolutely no idea how much it will cost ? Why did they make it so another player can sign my charter, I pay them 30g and then they delete their signature. Why? I stopped buying guilds cause of this. I hate the other players on my server for doing this..we have such a small server. I dont understand this statement:? You can not invite one of your alts to become a guild member because the alt will be offline (given you are online with another character). And given you will be the sole member of your guild bank it is therefore not so easy to pass your guild bank over to another alt if, for example, your character want to join a raiding guild. However, as the comments above have suggested, you only need to invite a third person, give them invite rights only, log off, log on your alt and get them to invite you. You can then log off that alt and log on again with your character to hand over guild leadership to the alt - the alt need not be online to do this. the third party involved can then be paid gold for their service and kicked from the guild, and your character can leave the guild. Hence, there is risk in this than thought. Just need to find someone willing to be a member for 5 minutes and pay them gold for this.